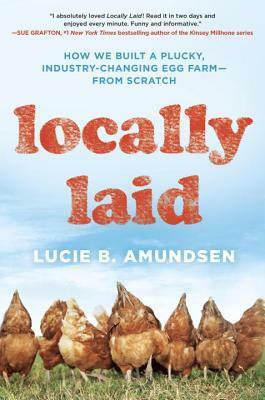 One evening over dinner in a Mexican restaurant, Lucie Amundsen’s husband Jason casually drops the bomb that he’d like to leave Corporate America behind and become an egg farmer. A locally sourced, pasture raised, foray into agriculture. Her reaction is essentially what mine would be: shock, hysterical crying, and the desperate hope that she was being punked. As it turns out, Locally Laid was no joke. Hilariously cheeky brand name aside, the process of acquiring a few thousand laying hens was no easy feat. And since the hens they did acquire had been raised in an industrial manner, Jason and Lucie not only had to learn how to farm, but also learn how to teach chickens act like chickens. With antique machinery and a heck of a lot of gumption, they set off on the adventure of a lifetime. There’s a steep learning curve when it comes to farming as you may well imagine, but chicken farming in Duluth, Minnesota? WINTER IS COMING. The story is funny, smart, informative, devastating, and heartwarming. Plus it’s got a whole lot of chickens named LoLa. I learned so much about agriculture in the US as a result of reading this book, which, frankly, is not a not a thing I’d have expected to find interesting. (I also learned a lot about chicken butts which is a thing I WOULD HAVE expected to find interesting. I’m just mentioning it because chicken butts.) I’m not a foodie, okay? I don’t get excited about artisanal cheeses or organic kale. I’m sure they’re awesome, but I was under the impression that local food was the exclusive domain of the foodie class. One of the things I loved so much about Amundsen’s book (aside from her killer sense of humor, because I would not turn down a beer with this lady) was that she made the whole concept of locally produced food seem accessible. She did a really great job of advocating for small and middle ag without making me feel like a complete jerk for my earlier willful ignorance. Does this mean I’m going to start getting up early and frequenting farmer’s markets? Probably not. BUT I plan to pay a little more attention in the grocery store. And maybe try my hand at a vegetable garden this spring. That’s a pretty awesome result for a plucky little book about chickens, no? It’s been THREE YEARS since I started Words for Worms. 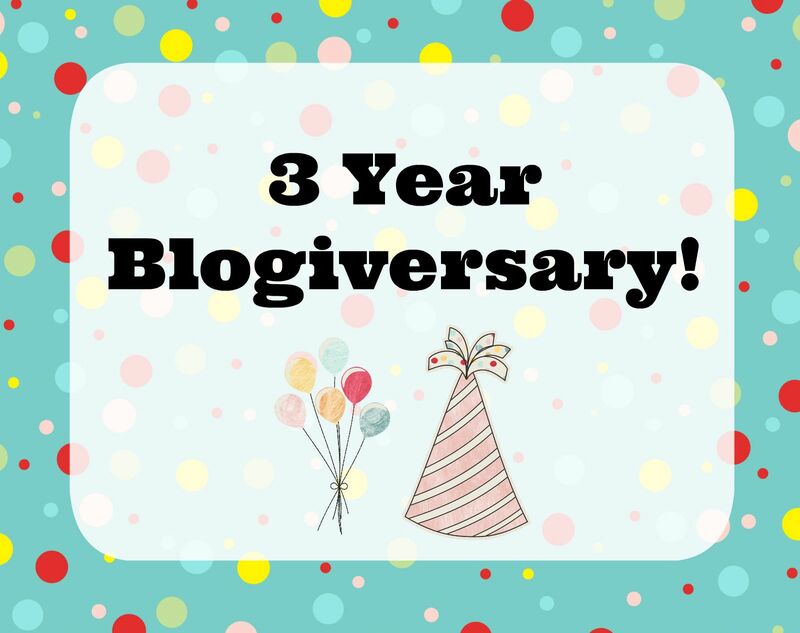 THREE YEARS! They’ve been years full of books, reviews, and zillions of weird lists. Also penguins. Oh my gosh I love this corner of the internet so so so so so much! To thank all of you awesome readers I’m going to do a giveaway so you can win cool stuff. I thought about compiling a box of weird fun things (socks with donuts on them, random excellent books, miscellaneous weirdness) but I realized that would discourage international readers because shipping miscellaneous weirdness overseas is very expensive. So. I’m going to give the winner an option. They can choose $25 to spend at Amazon (or other book retailer of winner’s choice because I am sensitive to the fact that not everyone is on board with Amazon) OR if the winner is a US resident and decides they want a box of crazy, I will compile something exceptionally fun and SURPRISE-Y for the winner worth at least $25. (I tend to go overboard with oddball merch if that influences your decision.) So, enter below. And thank you for three fun and fabulous years. High five! As you know, I’m a sucker for bookish swag. I work nerdy bookish accessories into my life and wardrobe like it’s my job, y’all. Lucky for me, there are some amazingly cool sites out there like Gone Reading. I LOVE Gone Reading, you guys. They have a ton of cool stuff AND they donate all their profits to charities that promote literacy initiatives in the developing world. There goes all your guilt about “wasting” money on “non-essential” items. IT’S FOR CHARITY! Brad at Gone Reading contacted me recently to see if I’d like to host a giveaway for my readers and/or review a product. Because they are AMAZING, I am now the proud owner of five literary finger puppets (a video puppet show is in the works, my pretties. I wanted to have it done by now, but you simply cannot rush the creative process… Or the husband who happens to double as your camera man.) In any case, I’ve for a $40 gift certificate to give away to one of YOU to shop at Gone Reading and buy yourself some sweet bookish stuff. Enter below! 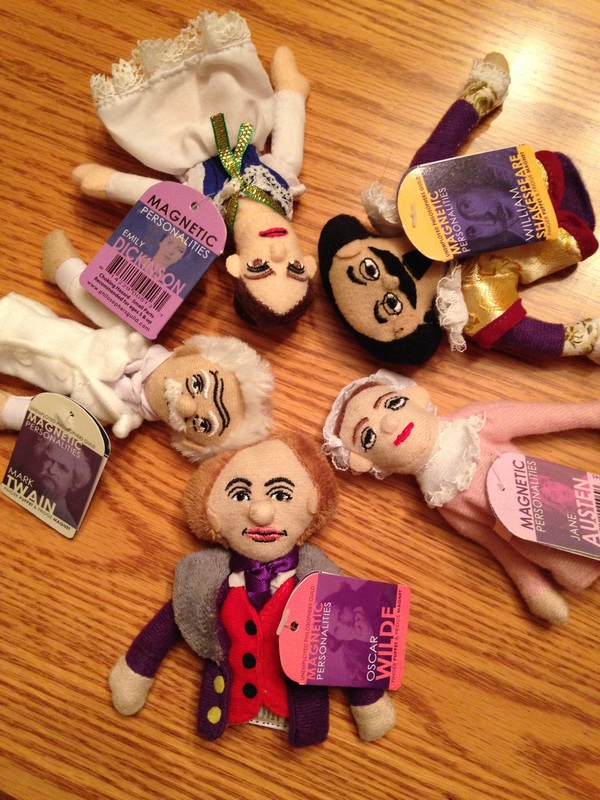 Emily Dickinson, Mark Twain, Oscar Wilde, Jane Austen, and my man Willy Shakes. He asked me to call him that. 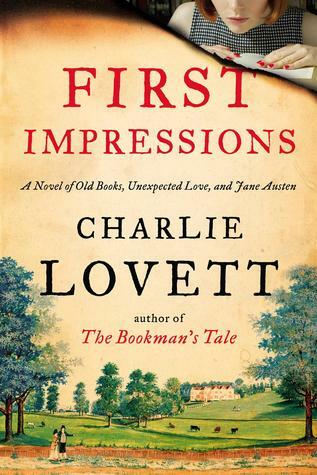 First Impressions by Charlie Lovett & GIVEAWAY! First Impressions is told in a dual narrative ping-ponging between the life of modern day Sophie Collingwood and the life and creative process of one Jane Austen. Sophie has recently finished her master’s degree and is feeling rather shiftless. She takes a job in an antiquarian bookshop until she gets things figured out, only to receive two requests for the same extremely obscure book in rapid succession. In researching the book, Sophie is drawn into a scandal that calls into question the authorship of Pride and Prejudice … And it might get her killed. Book enthusiasts can be intense, yo. Throughout the narrative we’re brought back in time to see Jane Austen forming a close friendship with her elderly neighbor Richard Mansfield. The two have a bond that undeniably shapes Austen’s work, but just how much of an influence was Mansfield? Back in the present, Sophie’s got mysteries to solve, not the least of which revolves around a pair of suitors. Sophie must channel her inner Elizabeth Bennet to figure things out and live to tell the tale. As an extra special treat for all my favorite book nerds, the awesome folks at Viking/Penguin have sponsored a GIVEAWAY of BOTH First Impressions AND a gorgeous Penguin Classics hardcover edition of Pride and Prejudice . This giveaway is open to residents of the US and Canada only. Check out the Rafflecopter goodness below to enter! It’s TOTES Time for a GIVEAWAY! 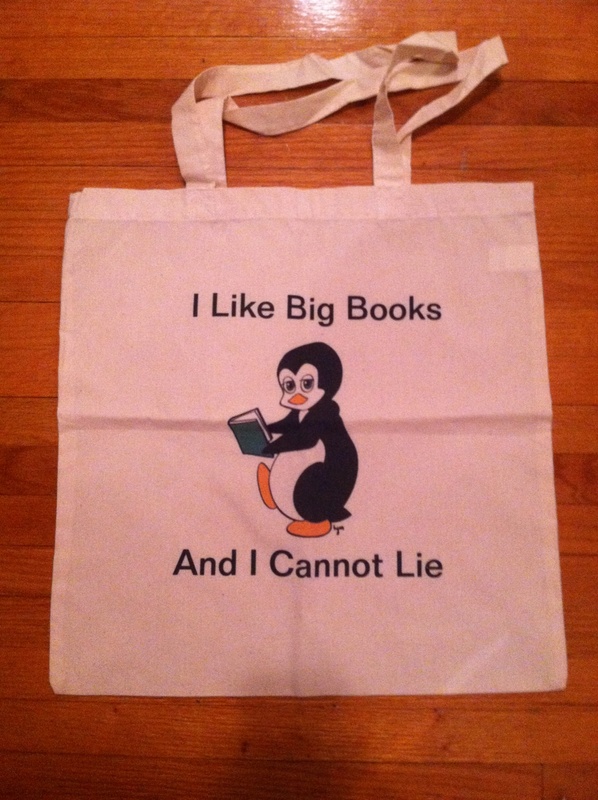 On offer today is this SWEET tote bag featuring the cutest penguin on the internet! You’ll also get a *very* gently used hardcover copy of Anthony Breznican’s novel Brutal Youth (review). Are you excited?! I know I am! Check out all the other giveaways HERE! Mear sets out with a delegation from the village including the fathers of the other fallen boys. They’re on a quest to take their poor children’s bodies to London in order to receive the King’s justice for their loss. Lemme take a minute to school you on the whole serf situation, k? It’s illegal for these normal everyday folks to take to the road without permission (and, apparently, a tunic) from their liege lord. It’s also crazy dangerous. There are bandits all up in those forests and there’s always the PLAGUE to contend with. Oh, and you better not be Jewish, because you might get burned at the stake. Makes you want to load a cart full of charred child corpses and take a hike, right? Bring out your dead! I really dug this book, guys. I love when historical fiction doesn’t shy away from dirty details, and the Middle Ages were so friggin grim. 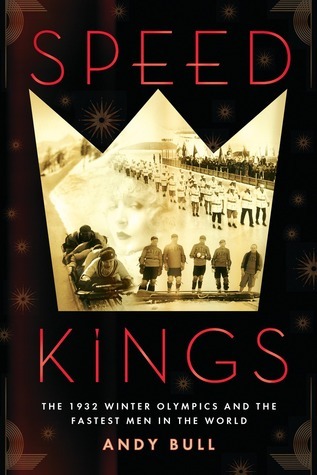 To add to the intrigue, this book is loosely based in historical FACT. The charred child corpses traipsing through the snow TOTALLY HAPPENED. Plus, there were Chaucer references all over the place, and it was the first time I found it useful to have read The Canterbury Tales in Middle English. (Thanks, college!) 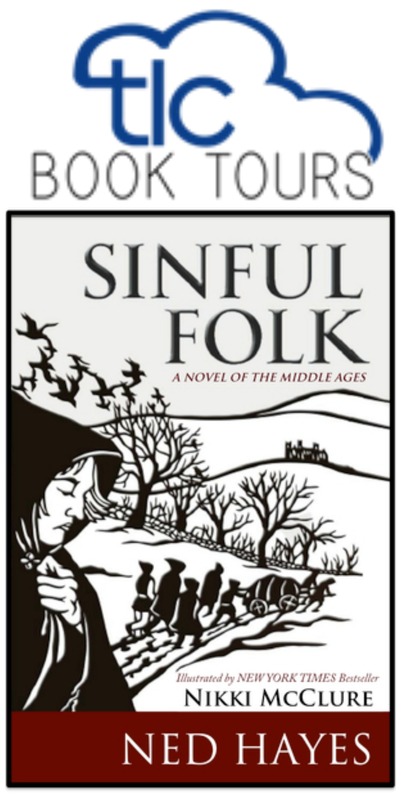 If you enjoy books like The Pillars of the Earth (review), its sequel World Without End , or the phenomenal Pope Joan (review) , you need to pick up Sinful Folk. Trust me on this one. If you still don’t believe me (even under penalty of plague) feel free to check out the other stops on the tour. Tell me something, Bookworms. How far would you go to seek justice? 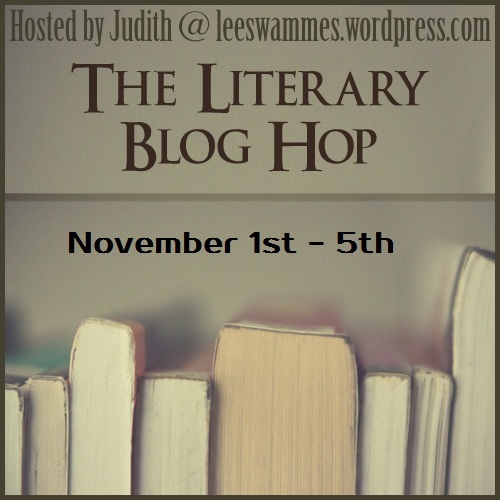 You’ll recall that last week I was raving about Longbourn by Jo Baker (review). It’s essentially Pride and Prejudice from the servants’ perspective, and it’s pretty great. A couple of months ago, I was hunting down digital books on my library’s website (as I am wont to do) and I saw that we were having an author event. With JO BAKER. In my town! I live in the middle of Illinois, y’all. We’re halfway between Chicago and St. Louis, which seriously limits our chances of being a book tour stop. I mean, who’s going to come to Peoria when CHICAGO and ST. LOUIS exist? Actually, my erroneous assumption that nobody cool ever came through Peoria kept me from monitoring these things. No more, I tell you. High five to the Peoria Public Library! 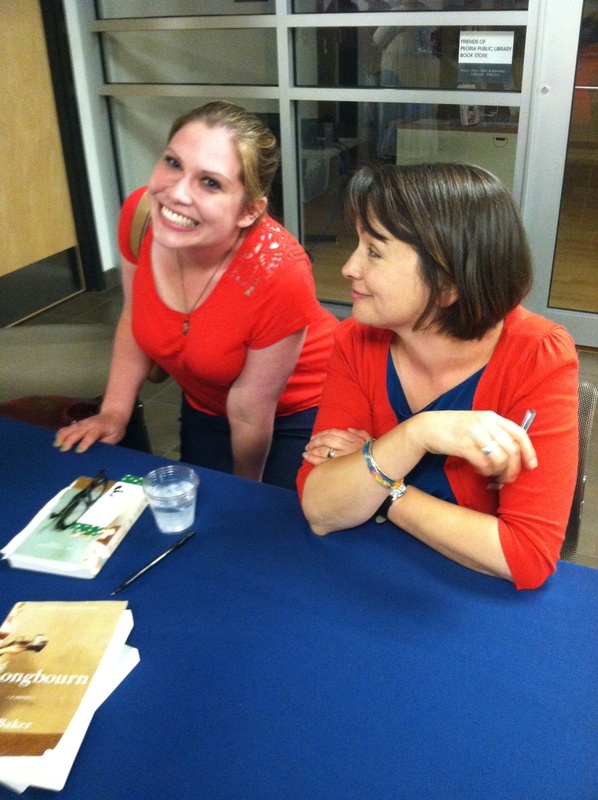 I was SUPER excited, as I’ve never been to an author event before. 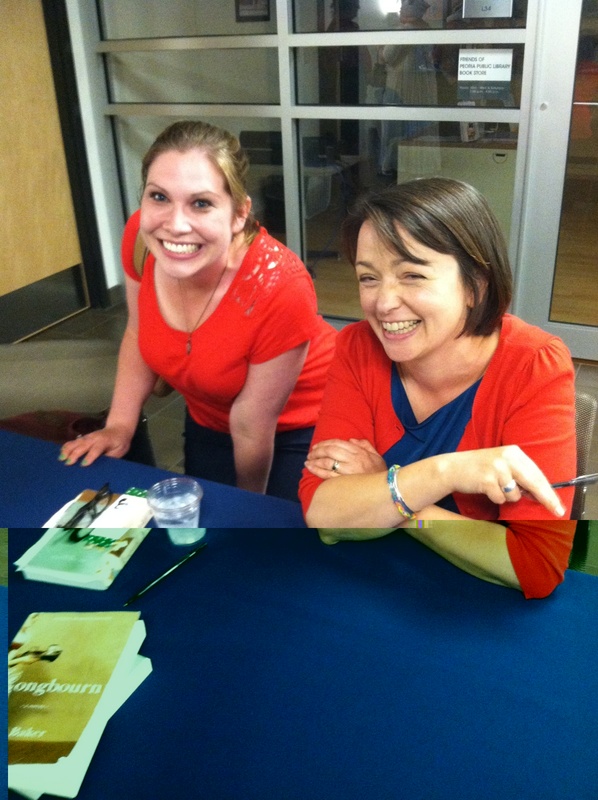 I was also rather nervous, because I loved the book and, well, I’m not very good at playing it cool. At all. I vacillate wildly between tongue tied silence and giddy over-enthusiasm in such situations. Neither is a particularly attractive reaction, believe you me. Giddy enthusiasm won the night, as I wasn’t a few feet in the door before asking a costumed member of the Jane Austen Society of Chicago to pose for a photo with me. I’m going to blame an unflattering camera angle for my gut, not my sweet tooth. I’m not sure how old Ms. Baker is, but she is quite adorable. An Austen fan to the core, Ms. Baker always loved the world of Georgian balls and social events, but felt a disconnect. 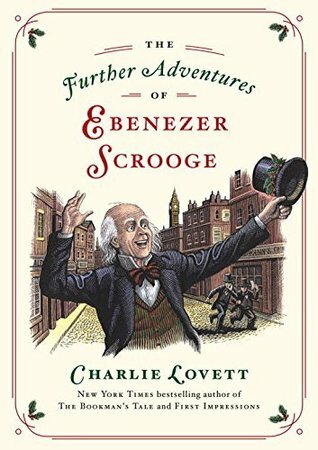 She understood that if she’d been born in that time period, she’d have been far more likely to have been washing the Bennets’ underthings than dancing and cavorting at a ball. I struggle with this ALL THE TIME when reading historical fiction! Much of what I read focuses on the wealthy or the ultra wealthy or friggin royalty. I’m with Lorde, here, y’all, I’ll never be royal. Extra fun tidbit? 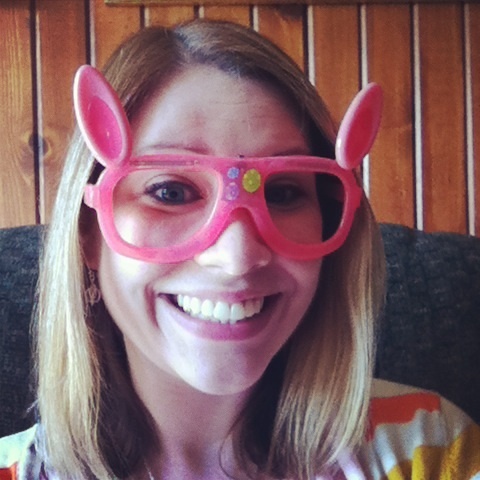 While researching the book, Ms. Baker tested out some old school cleaning method. Turns out cold tea is excellent for cleaning wood floors. The more you know. It’s a look that says either “I’m amused” or “I’m glad I live on another continent.” Possibly both. Definitely NOT the face of a gargoyle! All in all, I had THE MOST FUN! 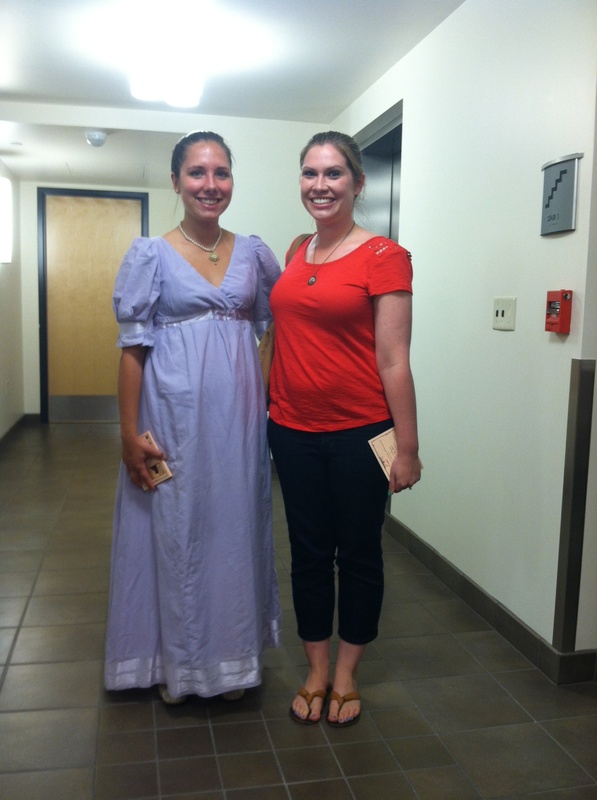 Austen enthusiasts in full costume? Authors who don’t call security on me? Brilliant! Ah, but you’ve heard already that I didn’t forget about you. Someone out there is going to WIN an AUTOGRAPHED copy of Longbourn!!! The only rule is that you have to live in the continental US to win, because shipping costs. Yikes. You want to win and have a US address for me to mail your winnings to? Enter here!